So we decided to just stay at home this weekend and work on the VWs and I would work on getting the yurt roof poles done. This morning, I set up the table saw and began choosing 36 2x2's that weren't cracked at the knots. I used John LaTorre's method of making poles which he outlines in his book, The Pavilion Book, a complete guide to buying, maintaining, and living in a Medieval-style tent. I met John at the vwcamperfamily camp-outs that we go to in the VWs. His book is awesome! I recommend buying it if you plan on making a tent or yurt, or even a tipi, because he gives a lot of good insider's tips. To make the poles, I cut the corners off to make a octagonal pole. Each pole went through the table saw four times, once for each corner to be cut off. I made 42 poles total, but ended up rejecting 6 of them because they had knots or splits that made the pole weak and bendy. In the picture, the poles look striped, but this is because the redwood was exposed to the sun for a while which made them brown. When I cut the corners off to round the poles, the red, "fresh" inside was exposed. 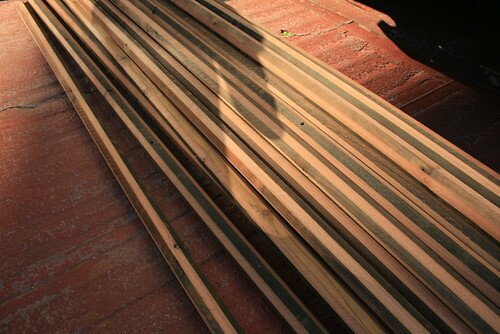 I think it looks cool like that, but I'm not sure if the brown parts would do well being coated with some spar varnish. The next thing I need to do is cut the poles to size. 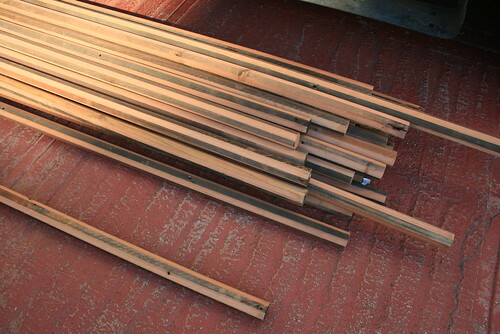 Since I am making a 12ft diameter yurt, the roof poles need to be 6ft long. The roof angle will be 30 degrees, thus making the crown 2.5ft in diameter. I will also need to taper the roof poles to make them easier to stick into the crown.